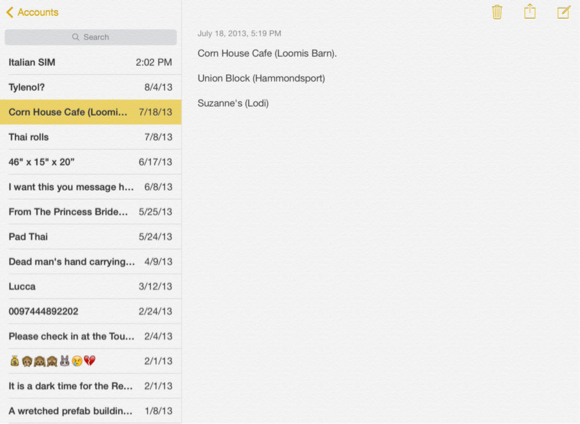 Notes and Reminders both had skeuomorphic looks in iOS 6, both of which have mostly disappeared in iOS 7. The new Notes and Reminders are sleeker, simpler versions of their predecessors. Notes has been part of iOS since the release of the first iPhone. It’s gotten a visual overhaul in iOS 7, though little in the way of new functionality. Gone is the lined yellow legal pad in iOS 7’s Notes app, replaced with a gentler, subtler look. Most prominently, Notes’s skeuomorphic yellow legal pad look goes away in iOS 7. Instead it gets a white paper-texture screen with buttons in yellow and a slightly embossed look. The app does lose its arrow buttons, which let you navigate between notes, though on the iPhone you can now swipe left across the screen to move up one hierarchical level instead of using the back button in the upper left. (This is a systemwide gesture that appears in many apps in iOS 7.) Also gone is the ability to switch the app’s fonts—you’re now stuck with the default system font. The stacked-card metaphor of Reminders may still be one of the few semi-skeuomorphic elements left in iOS 7. 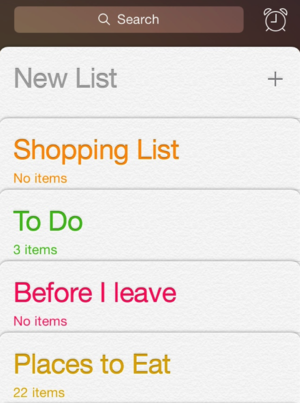 Reminders gets a decent visual overhaul in iOS 7. Like several of Apple’s other stock apps, it loses its black leather look; also gone is the calendar view the app used to offer. On the iPhone, Reminders represents your different to-do lists as a stack of vertical cards; the name of the list is printed in color at the top, in the same slightly embossed style as Notes, and below it is displayed the number of items on that list. You can rearrange the cards manually by tapping and holding on a card’s title bar, and then dragging it into whatever order you wish. When viewing a card, you can tap its title bar or swipe down on it to return to the main screen. 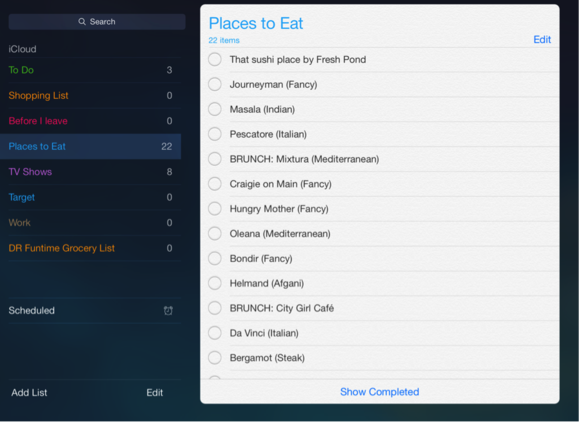 On the iPad, the stacked cards are replaced with a left-hand list of your various to-do lists. The iPad foregoes stacked cards for a two-pane approach, with your to-do lists on the left and the currently selected list on the right. To delete or edit the order of lists, tap the Edit button in the bottom of the left pane. To edit a reminder, you can either tap on it, and tap the info button to its right, or swipe to the left and tap the More button. Apple has revamped the location-based reminder interface in iOS 7, allowing you to specify the radius of the area in which you’d like to be notified. Another new feature is the Scheduled button, which is represented on the iPhone by an alarm clock icon next to the search field. Tap it to get a list of all the to-do items that have a date or time attached. As with the previous version of Reminders, you can schedule a to-do item to trigger at a specific time or at a specific location. 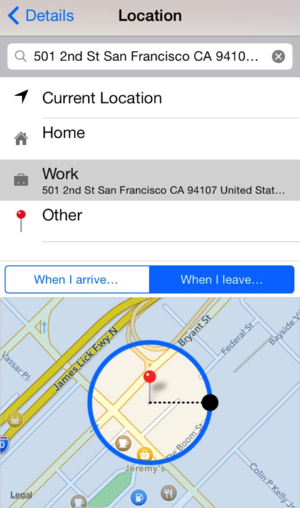 Apple’s refined the latter functionality slightly: When you choose your location, you’ll get a small map view of it, along with a circle around the pin indicating the area in which the reminder will trigger. You can even drag a handle to resize that area anywhere from a radius of 328 feet all the way to a radius of 7,920,000 feet (if you’d want to do such a thing). One still-missing feature of Reminders, however, is the ability to share lists with people—to do so, you’ll still need to use Reminders on the Mac or via iCloud.